This morning, mentor, partner and Climate Interactive co-founder John Sterman wrote with good news from the Sloan School of Management at MIT. Last week he challenged the crowd in a sustainability workshop for 550 Sloan alumni at the triennial Sloan Alumni Convocation. 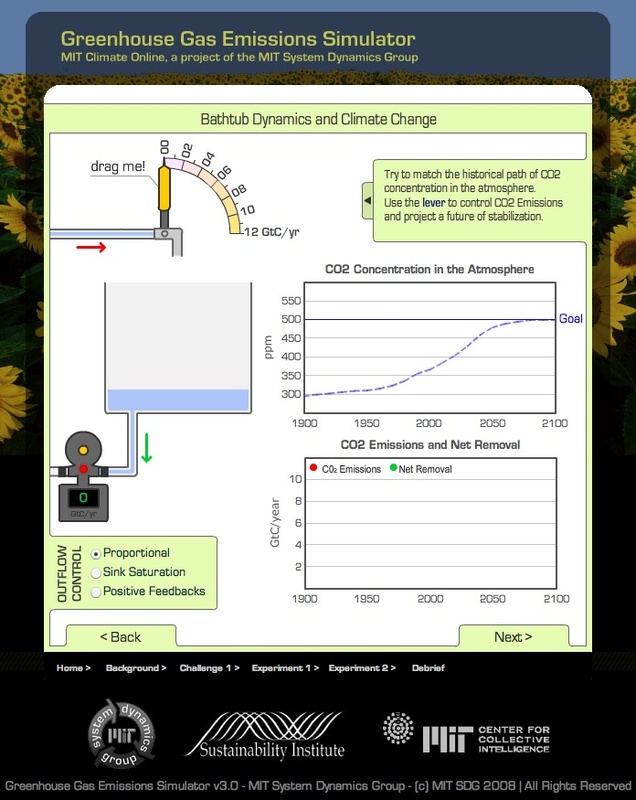 He talked about our Climate Interactive effort, presented one of the sims (pictured above), and engaged everyone in thinking about how to stabilize the climate. Click here or on the picture itself to explore the online sim that he built with Juan Francisco Martin, our team here at Sustainability Institute and the Center for Collective Intelligence at MIT. It is one of the more involved, deep exploration of climate dynamics. Its insights will be more understandable when MIT posts the video or more debrief material — at this point, you are a bit on your own. John also contributed a pdf of his slides for the presentation. Download them (10 megs) here or by clicking on the title page. Despite the missing voice and enthusiastic presence of Dr. Sterman, you can get a good sense of his message.